but in our jewellery collections, too! Our brand new Summer window display, featuring coral, a swarm of jellyfish, sand and of course beautiful and unique jewellery. So why not come and admire them next time you are in town?! Little selection of our Coral jewellery. From delicate stud earrings to chunky statement pendants, we have got a large range of coral jewellery. Natural coral is found in many colours. White being the most common, but a variety of other shades can be found, including pink, orange, red and black. Coral is usually dyed to enhance and deepen the colour. The majority of our coral jewellery is red, but we do have some more unusual blue pieces, too. To combat environmental issues, coral reefs are protected and coral sea farms have been created, especially in the South Seas and Australia. Our coral comes from a UNESCO certified source. 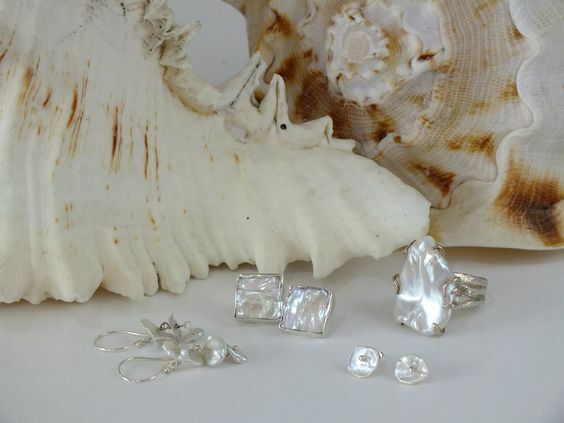 These treasures from the deep are produced by oysters, clams and mussels, which can create a huge range of different pearls. From the classis round pearl to more unique and individual baroque and keshi pearls. Depending on the conditions in which they grow, the colours can range from the classic white, ivory, peach to grey and almost black with a beautiful peacock iridescence. Examples of this can be seen in our pieces in store. So, be it a classic piece of pearl jewellery or something with a modern twist, our large pearl collection features something for everyone. This most colourful of all the shells is found in the Pacific and South Seas. Pinks and red to green, blues and purples can all be seen when this shell is viewed at different angles. 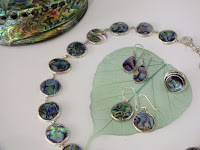 With its beautiful rainbow iridescence, abalone is so suitable and wonderful to use in jewellery designs and can be found in a broad range of pieces in all different shapes and sizes on our website and in store. With plenty more treasure to discover in our High Street shop in Cowes on the Isle of Wight, we think it really would be rude not to pop in and see us next time you are in town.